This recipe for a mixed berry smoothie is a refreshing and healthy combination of fruit and yogurt that’s kid-approved and super easy to make! Smoothies are a great choice for breakfast or as a mid-day snack. 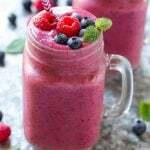 We are smoothie crazy in my house, we make smoothies almost daily including pineapple smoothies, blueberry smoothies and this simple mixed berry smoothie. Can you ever have too many smoothie recipes? I don’t think so! This mixed berry smoothie is my girls’ current favorite, so I figured it was time I shared it all with you too. It takes about 5 minutes to make, and it’s packed with protein thanks to Greek yogurt so it’s both filling and refreshing. How do you make a mixed berry smoothie? 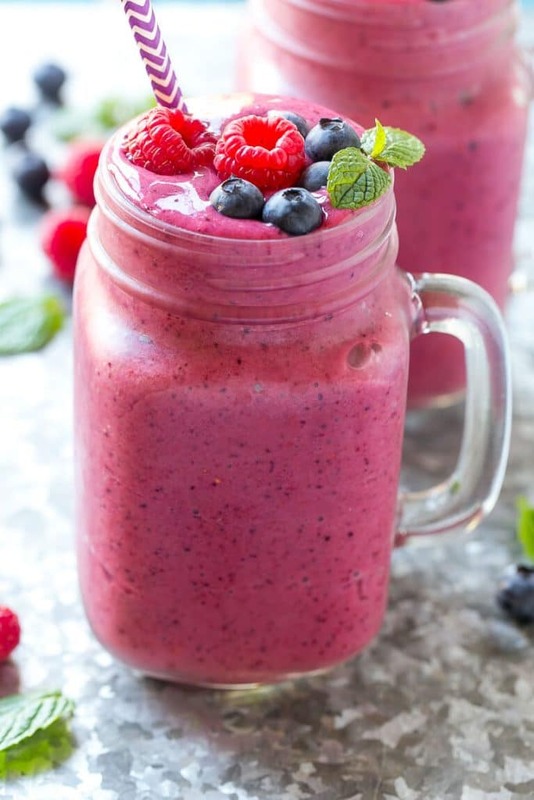 This mixed berry smoothie is simply frozen berries, banana, vanilla Greek yogurt, liquid of your choice, and sweetener if you desire. I buy bags of mixed frozen berries and always have a few in the freezer for when a smoothie craving strikes. I typically make these smoothies with apple juice as it eliminates the need to add any sweetener later on. Other liquid choices are skim milk, almond milk, coconut milk or even a cranberry juice would be nice. When I do sweeten smoothies, I typically reach for a little honey. Like I said, it’s really not needed here if you’re using juice, but you may want to add some if you go with a less sweet liquid like skim milk. I have an insanely picky 3 year old, and on days when I can’t get her to eat more than 2 bites of anything, these mixed berry smoothies are a lifesaver. Nutrients, protein, fiber – and they happen to be her favorite color, bright pink! So while this may be a simple recipe, it’s definitely worthy of sharing for all of you out there who are trying to get your families to eat (and drink!) healthier. Hope you enjoy! 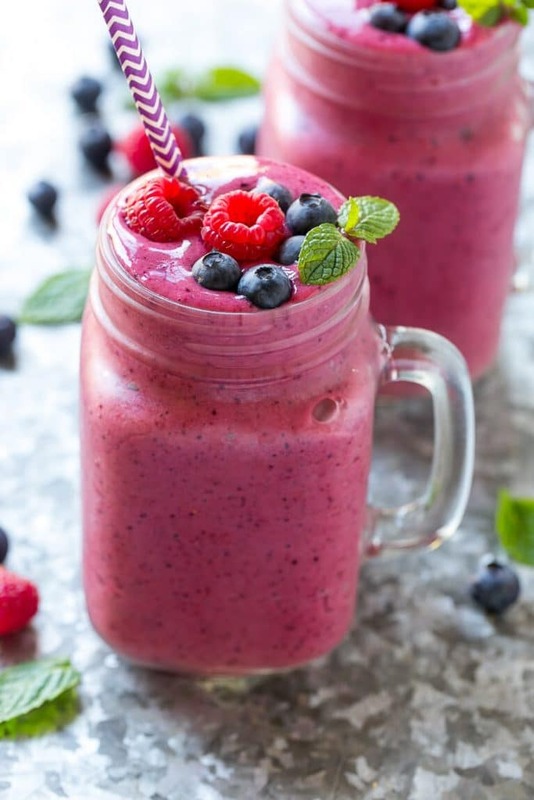 This easy mixed berry smoothie recipe is fast, healthy and delicious! Delicious, followed exact recipe, without honey. Also made it with almond milk, both taste delicious. Using frozen yogurt is just as good, but did you know you don’t even have to use yogurt If you’re trying to make a low calorie smoothie with mostly just fruit? Sounds yum and I can’t wait to try it tomorrow once my new blender arrives! I am new to smoothies and wondering why some fruits are used frozen in most? If I don’t like my smoothie too cold is it ok to use non frozen? Or does it change the texture or taste? 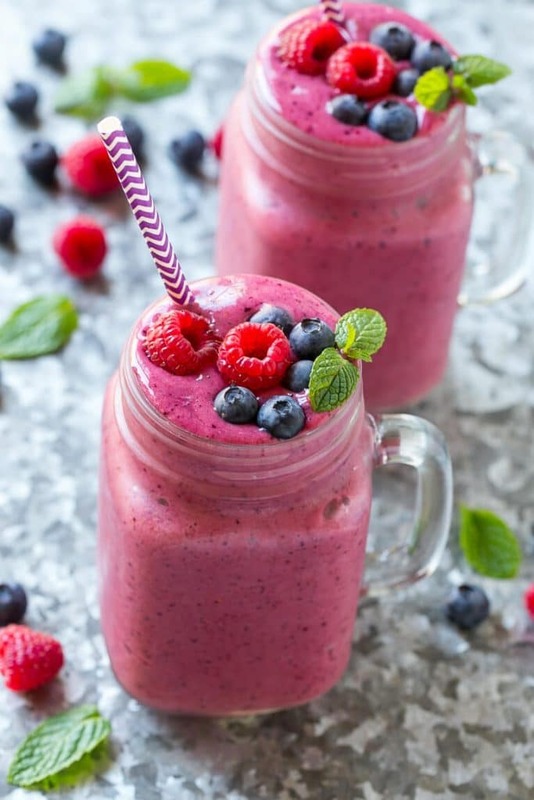 Frozen fruit is typically used because it gives the smoothie a thicker texture. You can use fresh fruit if you prefer, it will just be a little thinner! I made this recipe but smaller portions, not exact measurements. Delicious! It makes about 3 cups, not sure about the ounces although typically 8 ounces = 1 cup! You can use a different type of juice or milk. Super delicious!!! I recommend adding a couple pinches of chia seeds to make this extra healthy! Chia seeds contain tons of fiber! That’s a great idea, will try that next time! What if I dont have yogurt??!! You can try to make it without yogurt by adding extra banana so that it will still be thick and creamy. I love this recipe! I’m definitely going to add this to my list to make over this winter. I tried the smoothie recipe. It is great! It was flavorful and refreshing. Now I just need those cool glass mugs. Looks perfectly wonderful and healthy!